After leaving university Nick joined the Newcastle Evening Chronicle as a reporter, and continued to work for local newspapers in the North-East for several years before moving to London to work as a feature writer for the Sunday People. In 2000 he became a freelance writer, contributing to national newspapers and magazines. Shortly afterwards his first book was published: a guide to Coronation Street.Since then he has written on subjects ranging from cannabis to manufactured pop music. Nick’s last non-fiction book was a history of the Tour de France, published in 2007.Nick now runs a small news and features agency in Cumbria, where he lives with his wife, daughter and dog. It’s a sweltering day in Kenya and I’m hanging out of the open roof of a safari bus, camera poised, bush hat tipped at a rakish angle. But it’s not big game I’m after. I’m not even anywhere near the Masai Mara. No, my target is the headquarters of Coast Province Police, a collection of buildings hidden behind an imposing fence perimeter on Mama Ngina Drive in downtown Mombasa. It’s here that my fictional detective Daniel Jouma is based – and as the site is off limits to the public and particularly nosy English journalists, I’ve been reduced to some long-lensed paparazzi work. Edward Bejah, my normally amiable African driver, is in a state of increasing panic because even taking pictures of official buildings is against the law in Kenya. He can’t understand why the hell I’m so interested in the police headquarters anyway, or why I insisted on a tour of the general hospital and the Kongowea slum beforehand. Eventually I come clean. I am not as I seem. Yes I am in Mombasa ostensibly to write a travel piece for a UKnewspaper – but my prime motive for being here is to research my Kenya-based crime thrillers. And yes, I would like to see the croc park and the nature reserve, but only because I plan to use them for as set-piece scenes when kill off my baddies in cruel and unusual ways. Ah, writing fiction – don’tcha love it? Of course there is a serious side to all this. When you set your books 8,000 miles away in Kenya, there’s no point doing it all out of a Rough Guide. And while I admit I am not the world’s most diligent researcher, and while I maintain that over-zealous swotting can clog up the narrative drive of a crime thriller, I nevertheless feel I owe it to the readers – and my own credibility – to at least make the effort to see the place for myself. I have been to Mombasa on three occasions in the last two years, each time for intensive cultural immersion and specific off-the-tourist-trail sightseeing. I have half a dozen notebooks bulging with observations – enough hopefully to stand me in good stead for the four-book series I have been contracted to complete. Of course setting one’s books in Kenya can be an expensive business, and while I would love to be able to visit every year it’s not always possible. That’s why I spend an inordinate amount of time in my cramped Cumbrian attic scouring the Kenyan online newspapers for those little snippets that bring a country to life. Big news over there currently is the ritual sacrifice of albinos, who blood is thought to have magical properties. Duly noted. The badlands of the remote Rift Valley also make for good copy. Rarely a week goes by without some bizarre ritualistic murder taking place. A recent example involved a a man lynched for digging up dead bodies and eating them, believing it would lift a curse on his pigs. You don’t get much of that in Carlisle, I’ll tell you. Is it all worth it? I think so. 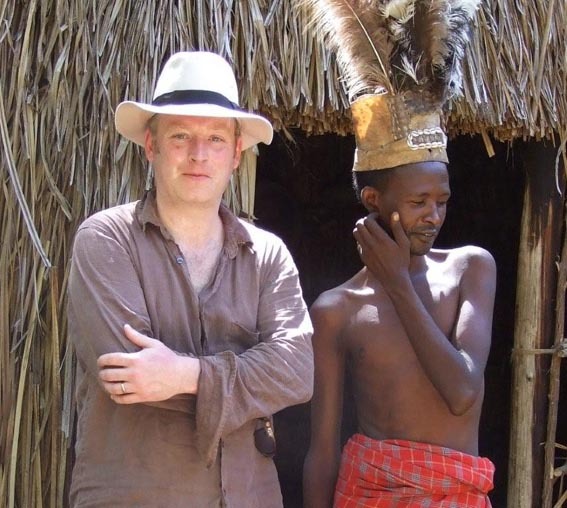 Certainly it was extremely gratifying, following the publication of my first novel BAIT in Africa, to receive little or no slagging off from the local critics about the accuracy of the setting. In fact the only quibble was from a reviewer in Kenya’s Daily Nation who set about my use of Swahili. His name is Stan Gazemba, and I took the liberty of contacting him – not to administer an Alain de Botton-style dressing down – but to ask him if he would have a look at the manuscript of my next book to check for similar errors. In return I am currently reading Stan’s novel. It’s called The Stone Hills of Maragoli, and despite winning the prestigious Jomo Kenyatta Prize he has found it extremely difficult to get published in his native country. I think it’s great, and when he is a big name in the world of literature remember you read it here first. It will be nice to meet Stan next time I’m in Kenya – because no matter how much research you do, there is always more to see and people to talk to. And that’s the beauty of this job.